You are at:Home»Aquarium Equipment»Activated Carbon Causing Head and Lateral Line Erosion? Activated Carbon Causing Head and Lateral Line Erosion? I stumbled across an interesting read on CORAL Magazine’s website claiming that activated carbon has been determined to be a likely cause of head and lateral line erosion in some marine fish. HLLE, as it is abbreviated, is a type of skin ailment that usually shows up in the form of lesions and torn skin around the eyes, fins, and lateral line of the affected fish. As the problem grows, the skin begins to erode and the fish can become permanently scarred. HLLE isn’t fatal, except in extreme cases, but it can be a very traumatic experience for the fish and concerned hobbyist alike. There have been many presumed causes of head and lateral line erosion, and people pointing the finger at activated carbon isn’t a novel thought. In fact, the association between carbon and HLLE was first described in the late 80’s. Despite this, documented causes of the ailment are still undetermined because nothing has been published through official scientific studies, though many informal studies and discussions do exist. So what evidence supports blaming carbon for causing HLLE? In addition to casual observations by hobbyist and professional aquarists, the Toledo Zoo has shown a direct correlation between carbon use and head and later line erosion in a very recent study. The zoo setup three systems, with one being subjected to lignite carbon, one using pellet carbon, and one as a control. Thirty-five tangs of the species Anthurus bahianus were then split up and placed into the systems. Two fish in the lignite carbon filtered system showed signs of lesions a mere 20 days after the carbon was added to the system. After four months, several fish in this system had severe lesions. On the system exposed to pellet carbon, none of the fish showed visible lesions, but microscopic systems did show up. A couple of months after the study concluded, two fish from this system did develop minor lesions. The fish in the control group didn’t develop any lesions, visible or microscopic, and six months after the study ended and the carbon was removed from the other systems, all of the HLLE lesions disappeared from the originally affected fish. 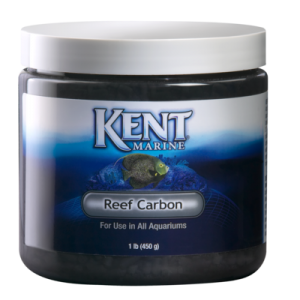 Activated carbon has been in use on both fresh and marine aquariums for decades. It does a great job of removing dissolved organic material, medications, toxins, water staining compounds and so much more. I still use carbon on my reef tanks and will continue to do because their benefit far outweigh their shortcomings. Just be careful with its use, as it can cause other issues other than head and lateral line erosion. Some hobbyists only use carbon a few days out of the month or only when their tanks become a little cloudy or discolored. They limit its use mainly because it strips good things from the water along with the bad, and leaches other substance back into the water. I still recommend using carbon in some form or fashion, but if HLLE shows up in your system, remove the carbon and try a different route like more frequent water changes, biopellet media, or increasing the size of your protein skimmer.